resin of ethylene and norborenene. for structure, and insulation market. Axson Technologies has its head office in Paris, France, and is the leader in the fixture resin and elastomer. 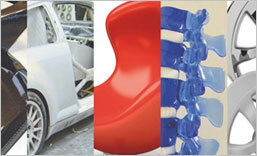 The company supplies resin that is used for design and to manufacture trial products. The outstanding polymer technology of Axson Technologies is applied in the structural adhesives and insulation market, and Axson Technologies’ solution is being selected in markets including the main industries such as aerospace, automobiles, construction, new regeneration energy, distribution, casting, machine tool, electronics industry. LABELITE 8 GY Rigid PU foam boards suitable for NC or manual machining. Good temperature resistanece. Chemical resistance to solvments. LABELITE 45 PK Excellent surface aspect,Good dimenstional stability. Models for the automotive industry. LAB 1151 Low density. Very good dimensional stability.Easy to machine. Resistant to abraision. LAB 850 Resistant to abrasion. Non filed. Thermoplastic finish. Good edge strength during machining. LAB 920GN Very good abrasion resistance. Thermoplastic finish.Easy to machine. LAB 1000 High density. Aluminium filled. High compression resistance. High dimensional stability. Good heat exchange coefficient. LAB 1360 Abrasion resistance. High dimensional stability. LAB 975 Low density epoxy board. High dimensional stabiity. Very good surface finish. Good temperature and pressure resistance. LAB 973 Low density epoxy board. High dimensional stabiity. Very good surface finish. Good temperature resistance. SC 175 SC 175 has been designed for marine, wind blade and automotive customers looking for a fast and reliable way to manufacture tools. SC 380 Easy to handle extrudable paste with high thermal resistance for large-sized models, mock-ups, parts and tools in the sectors of wind blade, shipbuilding, aircraft and automobile industry and for composites industry. SC 258 Low density epoxy paste. Manual or mechanical mixing. Machining with conventional woodworking tools or by NC machining. S 222 Low density, easy to use,Very good surface finish. SC 110 Low CTE, Easy to mix,Good dimensional stability. S 3000-S Low density, easy to use,Very good surface finish. MODELMATE Light ,soft, easy to mix,good adhesion to various supporting cores,easily carved by cutting tools. M 175 Epoxy repair mastic and for assembly of sections made with SC 175 : manual handling and hardening in less than 4h. M 380 Epoxy repair mastic and for assembly of sections made with SC 175 : manual handling and hardening in less than 4h. M 390 Epoxy repair mastic and for assembly of sections made with SC 175 : manual handling and hardening in less than 4h. LABELITE GLUE Excellent surface aspect with invisible bonding line,coherent with the Labelite boards. Mono-component,no mixture needed. Quick setting, easy machining. H 9930 Quick setting multi-purpose unfilled liquid epoxy adhesive. H 9951 Epoxy adhesive to bond high density slabs (>1). H 8973 Thixotropic epoxy adhesive for LAB 973. PX 100 Long or short potlife with easy mixing. Easy to pigment and paint. Low aggresive to silicone moulds. /L Long or short potlife with easy mixing. Easy topigment and paint. Low aggresive to siliconemoulds. PX 223 HT Low viscosity. Good impact resistance. High temperature resistance. Does not attack silicone moulds. Resistant to hydrocarbons. PX 527 Transparent resin. Impact resistant. Thermoplastic behaviour. High elongation at break. /S No mercury, excellent UV resistance, High mechanical properties, cast up to 30mm. PX 330(2) Approved both UL94-V0 and FAR25. Easy to use. Compliance ROHS. *pot life 8mm Filled. Very short demoulding time. Very rigid. (1) Following complete heat treatment(See technical data sheet). (2) Meets the requirements of the FAR 25.853 regulations for inflammability:12 secnods over 2.2mm. RIM 875 BE(beige) High impact resistance. Polyol resin can be added to obtain intermediary stiffnesses. RIM 872 Intermediate between RIM 875 and 876. Intermediary stiffness, ready to use. RIM 876 BE(beige) High impact resistance. Polyol resin can be added to obtain intermediary stiffnesses. RIM 631 Flexible, rapid setting product. Rubber aspect. Weather resistant. RIM 702 Very high impact resistance. Easy to use in low pressure machines. RIM 974 Hardening specifically adapted to the rotomoulding precess.Very easy to use. High temperature resistance. Rapid demoulding. Good impact resistance. Can be painted. RIM 974 Semi rigid system dedicated to large parts. could be used with rotational technique. impact resistant. Mixing by hand or with a 2K machine. ESSIL 120 C Low hardness polycondensation silicone. UR 3420 High tensile strength. Water resistant. Low viscosity. UR 7863 No mercury, VOC, MDI. Low viscosity, cast up to 40mm. No shrinkage dumps, No moisture sensitivity, Repair on itself. UR 3435 Low viscosity. Good tear resistance. Water resistant. Low toxicity. UR 3445 Low viscosity. Low toxicity. Exellent tear resistance. Water resistant. UR 3450 Good abrasion resistance. High tear resistance. Good resistance to hydrolysis. UR 3460 Good abrasion resistance. High chemical resistance. Good resistance to hydrolysis. UR 3468 Good abrasion resistance. Excellent tear resistance. UR 3490 Reduced toxicity. Excellent impact resistance. Rapid hardening. UR 3546 Good tear and abrasion resistance. UR 3558 Good impact, tear and abrasion resistance. Rapid demoulding. UR 3569 Without MDA. High abrasion resistance. Unbreakable. UR 58300 Low hardness elastomer for molding concrete parts with intricate surface patterns. No mercury. UR 5848 Medium hardness elastomer with high chemical resistance. UR 5863 High resistance to concrete release agents for long lasting molds with standard patterns. UR 5895 Good resistance to chemical solvents. Excellent tear resistance. Several cure speeds by manual or machine processing. F1 Low shrinkage, even when very thick(constant shrinkage). Fine grain. F23 Excellent surface finish. Easy to sand. Gloss recovery. Polishable. F40 Excellent abrasion resistance, low shrinkage, low viscosity. Rapid demoulding and use of moulds. F180 Good impact resistance,Excellent mechanical properties,Easy to drill. F19 Very low shrinkage. Low viscosity. Long pot life. F31 Rapid demoulding. Good substrate for painting. Compatible with electro-plating. F33 Easy demoulding:possible to cast fragile parts without risking breakage. Good impact resistance. F38 Excellent impact resistance. Low viscosity. Thermoplastic-type finish. Good substrate for painting. F202 Opaque even in small thickness, Good ability to be painted. Short demoulding time, Good UV resistance. Low chemical attack towards silicone moulds. 2012 Low mixing viscosity, choice of 3 hardeners. Good sliding coefficient. 5031 Low viscosity and 2 hardeners for surface or plain casting of tools needing highest abrasion resistance. EPO 4036 Very good surface aspect, easy surface treatment, good thermal conductivity, for large scale casting. EPO 4035 Aluminium filled system with medium reactivity allowing large size casting and self-postcuring upon mold using. EPO 752/2080 Very good mechanical characteristics. Heat resistant. EPOPAST 400 Standard laminating paste. Very easy to mix. Very low shrinkage. B 4000 High temperature resistance, 2-part paste. Easy to use with mixing ratio. GC1 050 Gelcoat with good corner strength. Good covering power. Easy to sand and good glossing characteristics. GC1 080 High resistance to chemicals. Easy to apply. GC1 125 Good thermal conductivity. Aluminium aspect. GC1 150 High resistance to chemicals. Very good glossing characteristics. GC2 070 Abrasion resistant epoxy Gelcoat. *after appropriate heat treatment(see techncal data sheets). /2008S Low viscosity and good wetting ability. EPOLAM 2051 High thermal resistance, Easy processing, Dimensional stability, simplified postcuring. EPOLAM 2019 Low viscosity. High thermal resistance. High thickness resistance. EPOLAM 2035/2025 Low viscosity systems for producing moulds by infusion. EPOLAM 2070 New tooling infusion system with excellent compromise between processing time and mechanical strength build-up for ultimately tools having up to 160℃ heat resistance. EPOLAM 2092 High temperature resistance. Excellent wettability. RSF 816 Low viscosity. Brush application in thin coats. Variable pot life through addition of EPOLAM 2020 accelerator. /2017-S New system with same processing benefits as Epolam2015 and LLOYD'S Register approved but with much quicker demoulding times. EPOLAM 2020 Variable curing time through addition of an accelerator. Low viscosity. Good Wettability. EPOLAM 8*** Brand new product family dedicated to new application. For more information ,plesae refer to our new Composites brochure. /5016 Very low viscosity infusion system with excellent wettability for producing parts. LLOYD’S APPROVED. /2047 Low viscosity with excellent wetting of fabrics and adjustable reactivity with 2 compatibles hardeners. Germanischer Lloyd (GL) approved for high performance composite parts.